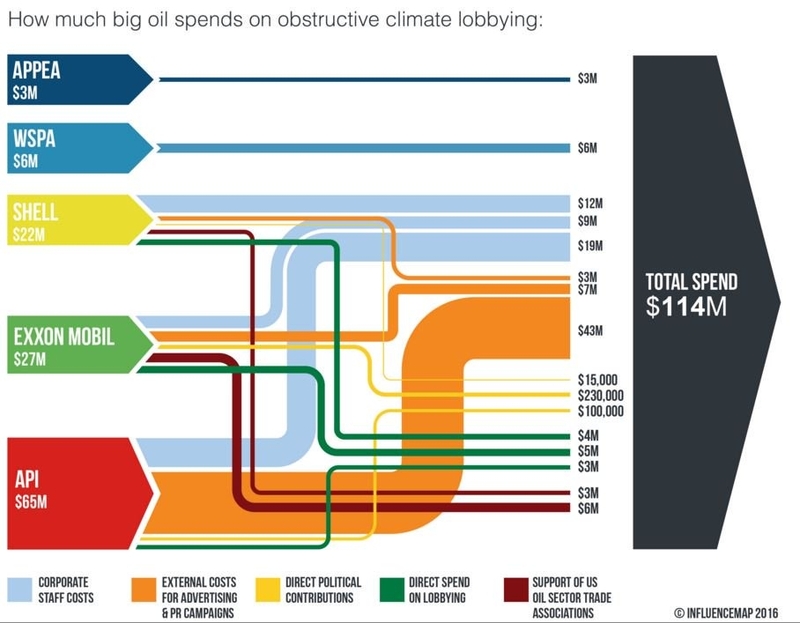 The UK-based non-profit Community Interest Company (CIC) called ‘InfluenceMap’ has produced the below Sankey diagram on obstructive climate lobbying of oil firms and interest groups. These are the spendings in US$ for an unspecified year (possibly 2015). Streams are color coded to specify the type of spending (e.g. staff cost, direct lobbying, party donations). Note that the yellow flows (in the range up to 230.000 US$) are not to scale with the others that are on a million US$ range. Some of the elements that represent the sources and the black sum arrow are also overemphasized, showing a height that is larger than the sum of the individual arrow magnitudes. So this is not fully adherent to the principles of a Sankey diagram … but to be fair: they never claimed that it is a Sankey diagram. This is maybe the first Sankey diagram ever to be featured in the US Senate. Senator [D-RI] Sheldon Whitehouse (yes, that really is his name … you just have to love his “Whitehouse Statement on …” catchphrase) used it in a US Senate testimony in April 2016. A.J. Simon describes the latest (2015) of the U.S. energy flow charts published annually by Lawrence Livermore National Laboratory (LLNL). Well explained and educative. Enjoy your 3 minute class on ‘How to read an LLNL energy flow chart (Sankey diagram)’. Just discovered this new Sankey diagram video via e!Sankey Forum. Apparently just meant as a a show case for the possibilities offered by the e!Sankey software development kit (SDK). We can see mass flows on a production line with two machines feeding ‘Item A’ and ‘Item B’ into the main production line. Found that there are some more (educational) videos on youtube now that deal with Sankey diagrams. Just came across this video featuring a “Sankey diagram of the Taiwan economy, jobs and energy in 2010” by ARUP (uploaded to vimeo by user Simon Roberts). The underlying model is called “4see-TW” framework and has been created to “investigate the structure and function of an economy in a resource-constrained world”. This is certainly exciting… howevever one must be warned that the Sankey diagram includes different “dimensions”: energy flows, value streams (money flows) and jobs. These three perspectives probably have different unit types and units (such as, e.g. TJ for energy, Euro or US$ or New Taiwan Dollar TWD for values, and persons or workplaces for jobs). Hence the width of the Sankey arrows mustn’t be compared to each other across the unit types. Haven’t found the time yet to dig more into the 4see-TW model, but here is one starting point (edit: link doesn’t work any more) for those interested.